Tags: compression, control, golf balls, ladies, lady, Mix, smooth feel, used, velocity, Volvik Surlyn Mix, womens. The Volvik Crystal is a premium level 3-piece golf ball designed for advanced golfers with slower to medium swing speed. 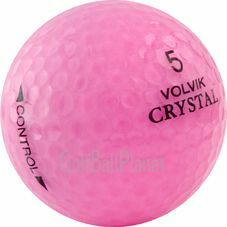 Volvik Crystal elevates short game control with a soft feel and low compression control core. Explosive distance and more accurate approach by soft Power Core, Control Layer and Soft Crystal Surlyn Cover. • Excellent putting feel and optimal spin rates by more durable Soft Crystal Surlyn cover. • Improved flight stability and consistency through specially designed 350-Octahedron dimple pattern. PLEASE NOTE: This mix will not contain a set percentage of each model.